Simplicity Bias Tape Marker. Create customized single fold bias tape with the push of a button! Includes 1" tip. l.
Machine comes with tip to make 1" single fold bias tape. 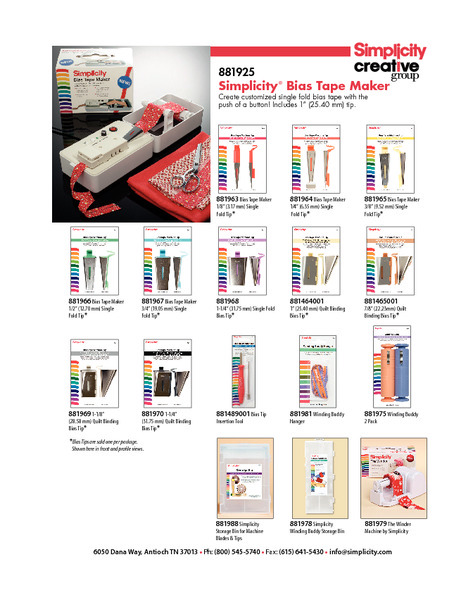 6 Additional tips available below under "Recommended Accessories"
881925 Simplicity® Bias Tape Maker Create customized single fold bias tape with the push of a button! Includes 1” (25.40 mm) tip. 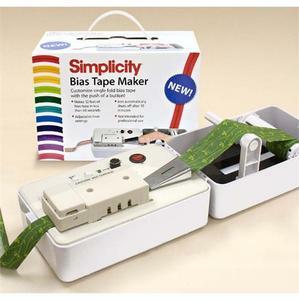 I just purchased the Simplicity Bias Tape Maker Machine last night. I love the results, but had to fine tune a few things. I would like to pass some hints. After running the fabric through a few times, I had an uneven area around the seam. I tried starching but received the same result. I cut the fabric a scant 1/4 narrower along the entire length and found that this took care of the problem and tape is beautiful. The clip is not useful as it is very tight and the whole spindle came off and traveled toward the iron, so I stopped and removed the fabric from the clip. So now to resolve that issue, I do not use the clip. If you don't have a bias tape winder, you can pin down at one end to work table or ironing board with three pins, to distribute the same tightness and wind on spindle. I am planning to get the Simplicity bias tape winder very soon. I am very happy with the result after the adjustments I made. I highly recommend this product! I received my order in a very timely manner. It arrived before the date I was given. This is a Christmas gift for my mother and I know she will love it. Thank you for a great experience with your company. Always a pleasure doing business with this company. Your service and the ordering process was great. I received my order in good time and everything was good. Thanks for a great ordering experience. I am impressed with the selection of products that is available from your company. From ordering to receiving was five days - which I loved! I also like to be able to pay the customs and taxes up front, so that there is nothing more to pay at delivery. I will certainly be using your company again in the future. This is my 4th order from your company and I am extremely happy with your products and service and in the timely manner you get the product to the customer. Thank you for your great service. I will continue to shop and buy from your company. I have ordered several items from AllBrands and have been extremely satisfied with everything!! If I am interested in purchasing any item I think you will have, I always search you first and almost always purchase the item here!! Thank you for your excellent services!! You have a wonderful company and I really enjoy doing business with you and your company! Have a wonderful day. I haven't used it yet so cant spea on quality. The price was the better than I found in the stores. I am pleased so far. I was a bit apprehensive about buying from abroad but the transaction was painless and the product arrived just 5 days after ordering. I have been very pleased with your service and would buy again with confidence.